With the warmth of an endearingly eccentric relative, 86-year-old Boman Kohinoor of Britannia Restaurant, tel: (91-22) 2261 5264, in south Mumbai, exclaims, "You must try the berry pulav, which my wife introduced in 1982 after returning from a trip to Iran." A waiter appears moments later with saffron golden rice and tender chunks of curried potatoes, fried cashews, wisps of crispy onions and ruby-red barberries imported from Tehran. "In Iran, the food is dry and bland by Indian standards so my wife experimented to find the right spices to liven up the dish," says Kohinoor. "But the exact recipe is a closely guarded family secret." Britannia  founded in 1923 by Kohinoor's father, Rashid  is part of a dying breed of family restaurants run by Mumbai's rapidly dwindling Zoroastrian, or Parsi, community. "Fifty years ago, there used to be around 500 Parsi restaurants along the stretch of south Bombay; now there are hardly 15 left," says Kohinoor, who doubts his own restaurant will survive him. Zoroastrianism, the world's oldest monotheistic religion, was once followed by millions in ancient Persia, but today claims as few as 124,000 adherents worldwide. Despite fears of impending extinction, Indian Zoroastrians neither allow conversion into the faith nor recognize children of interfaith marriages, according to Ramiyar P. Karanjia, principal of a Zoroastrian religious school in Mumbai. These are some of the reasons why the community of 70,000, the world's largest, is declining by about 10% every decennial census, according to UNESCO. Today Paradise Restaurant in Colaba, tel: (91-22) 2285 5629, near Strand Cinema, serves the best dhansak outside of a Parsi home. Jimmy Boy, tel: (91-22) 2270 0880, off Horniman Circle in the Fort District, is the place to go for a taste of lagan nu bhonu  the traditional Parsi wedding spread  if you don't want to wait for the increasingly rare occasion when two Zoroastrians tie the knot. The meal is always finished with baked wedding custard sprinkled with almonds, pistachios, cardamom and nutmeg powder. Ideal Corner, tel: (91-22) 2262 1930, off Pherozeshah Mehta Road, serves an auspicious meal that is usually eaten on Nowruz, the Zoroastrian New Year (March 21). But at Ideal Corner the yellow lentils, spicy prawn salsa and saffron rice are available every Monday. A la carte delicacies include mutton in coconut paste and cashew gravy (kid ghost) and okra in a spicy tomato sauce (khara bhendi) . To properly conclude a feast like this you must, as the Parsis say, "mithoo munoo"  make the mouth sweet. Visit Parsi Dairy Farm, tel: (91-22) 2201 3633, for a taste of agarni nu ladvo. This conical dessert is made by simmering pulses and grains in sugary ghee. It is traditionally eaten to celebrate seven months of a pregnancy, but the declining number of Parsi births means that nowadays members of the community simply enjoy the dessert whenever they please. 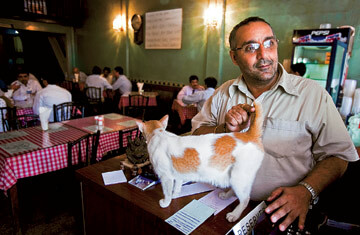 "Parsis will go extinct, but not the Parsi food," says Kohinoor. "Everyone loves the taste."